At BM Engineering Supplies, we stock a large range of pharmaceutical production equipment from engineering experts Bürkert. In the pharmaceutical industry, sterile and hygienic conditions are vital. Because of this Bürkert has been developing quality instrumentation ready-made for the pharmaceutical industry for over 40 years. In this article, we will be discussing a range of Bürkert pharmaceutical manufacturing equipment that is perfect for pharmaceutical manufacturing. As top of the market pharmaceutical processing equipment manufacturers, Bürkert focuses on supplying individual solutions for specific applications. Concentrating on cleanliness, easy validation and high standards, Bürkert is able to manufacture quality, focused products for medicine production, clean utilities and steam-controlled pasteurisation, to name a few. Here at BM Engineering Supplies, we specialise in Bürkert pharmaceutical manufacturing products in Scotland and the UK. We offer Bürkert’s full range of pharmaceutical automation technology. Bürkert’s specialised range of pharmaceutical production equipment includes products ranging from valves to flowmeters. Below you can find a selection of Bürkert pharmaceutical manufacturing equipment all available at BM Engineering Supplies. Bürkert’s Type 2103 2/2–way Diaphragm Valve is a perfect component for the pharmaceutical industry. Consisting of a pneumatically operated piston actuator, a diaphragm and a 2/2–way valve housing made of stainless steel, the Type 2103 is designed for usage in hygienic or aggressive environments. The compact and smooth design of the Type 2103 valve enables easy integration of pharmaceutical automation modules. These include electrical/optical position feedback, pneumatic control units, integrated fieldbus interface and even explosion proof device versions. Another Bürkert valve well suited for pharmaceutical manufacturing is the Type BBS-10 sterile check valve. Designed for fluids and steam, the flow direction of the Type BBS-10 is selectable which would make installation simple and very cost-effective. All BBS-10 sterile check valves are in-line with the latest standards in the biopharmaceutical marketing. 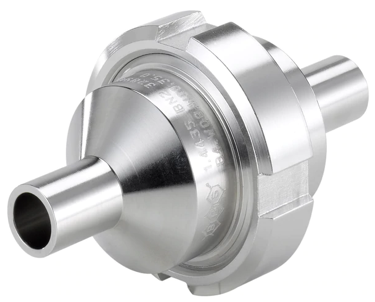 A unique feature of this sterile check valve is that it can be mounted in the vertical position, allowing self-drainage until empty. This helps achieve the correct angle according to standard installation techniques. 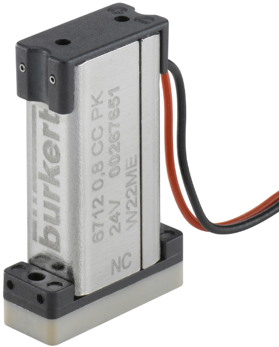 If you’re looking for precision valves that deliver near silent operation and excellent media selection, then Bürket’s Type 6712 WhisperValve should be considered. Designed for medical applications such as drug delivery systems and in-vitro diagnostic work, the Type 6712 contributes to an advanced piece of pharmaceutical production equipment. As the name suggests, the WhisperValve has a very low switch noise of less than 36db and boasts a switching time of less than five milliseconds, which means less noise pollution and disturbance when used. 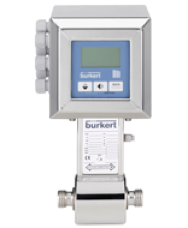 The Bürkert FLOWave Type 8098 uses Surface Acoustic Waves (SAW) technology for use in applications requiring the strictest hygienic conditions; such as pharmaceutical applications. FLOWave achieves incredible sanitary levels thanks to its all stainless-steel materials. It also offers a tube free of inner parts and the ideal exterior design without any fixing components. 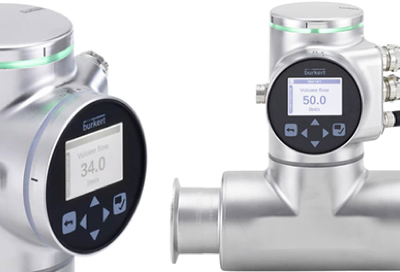 Designed for hygienic applications and the measurement or monitoring of water and other liquids, FLOWave sets new standards in flow measurement instrumentation. It offers a range of useful features, including flexibility, cleanability (CIP and SIP), compact size, light weight, easy installation and handling, and a compliance with numerous safety and hygiene standards. As such, this makes the Type 8098 ideal for injection applications where the fluid needs to be ultra-pure. Therefore, the flowmeter does not conduct electricity and hence a mag-flow cannot be used. To purchase Bürkert pharmaceutical manufacturing products in Scotland and the UK, or to learn more about pharmaceutical production equipment get in touch with BM Engineering Supplies today on 0141 762 0657 or via email on sales@bmengineering.co.uk.